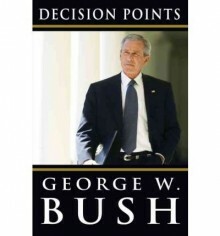 Decision Points is a memoir by former U.S. President George W. Bush. It was released on November 9, 2010, and the release was accompanied by national television appearances and a national tour. The book surpassed sales of two million copies less than two months after its release, breaking the record previously held by former President Bill Clinton's memoir My Life. Decision Points also opened at #1 on the New York Times bestseller list. Bush's 481-page memoir is broken up into 14 chapters. The first two chapters are about his life before the presidency. The first chapter is about notable events in his earlier life such as his decision to quit drinking in 1986. The second chapter is about his decision to run for Governor of Texas, and then President of the United States. The remaining twelve chapters are about events during his presidency: the September 11, 2001 terrorist attacks, the wars in Iraq and Afghanistan, aid to developing countries, the "surge" (a decision to deploy more U.S. troops to Iraq in 2007), domestic issues (including Medicare Part D, Social Security reform, No Child Left Behind, and Immigration reform), the federal response to Hurricane Katrina, embryonic stem-cell research, and the financial crisis of 2008. He wrote with the research assistance of former White House Deputy Director of Speech writing Christopher Michel. In the book, Bush expressed his moral dilemma with stem-cell research. He extensively consulted members of his administration about the pros and cons of the issue, learning about the benefits of stem-cell research while trying to find ways to avoid encouraging abortions. His opposition of abortion was inspired by him seeing (and holding) a jar of his mother's miscarriage fetus during his childhood. Bush writes that his decision to only use existing lines has been vindicated by recent successful research undertaken with non-embryonic stem cells. One of a handful of 5-star books I have read. Every American should read this book, whether you are Democrat, Republican, Conservative, Liberal, Independent, Tea-Party, PETA, whatever. I was riveted to this book. I waited in line for a long time to not only get the book but I also got it signed and met with Mr. Bush. This is one of my pride and joys on my bookshelf and a very moving read. This book was great. It was enlighteing to read about the world events from W.'s POV. 9/11, Iraq, both election campaigns--it's all in there and it's facinating!